It’s literally a book of war stories. But it’s also a book about war stories. What makes a war story true? The facts? Or the fable? O’Brien says a tall tale can be more true than what actually happened. Maybe because exaggeration better satisfies the need to communicate feelings. 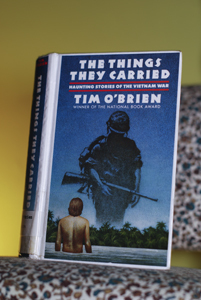 O’Brien blends fiction and truth about the Vietnam war till you learn to hear the stories without caring about specific facts. This book is about experiencing war. And telling about that experience through stories. It’s obscene and poetic, violent and emotional. What did the soldiers carry? More than I have.